Indie Retro News: Russian Subway Dogs - Arcade-simulation for PC and MAC looks crazy fun! Russian Subway Dogs - Arcade-simulation for PC and MAC looks crazy fun! 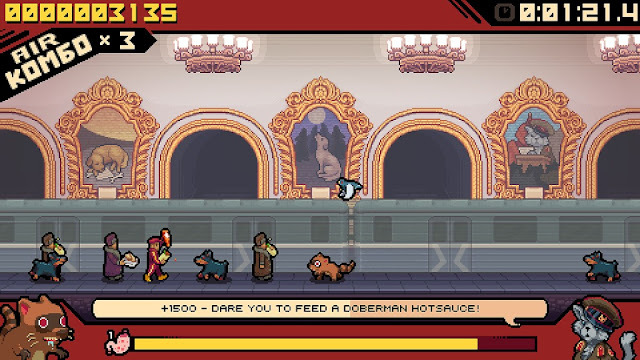 From the creators of They Bleed Pixels, SpookySquid has recently announced their latest game ' Russian Subway Dogs ' for the PC and Mac. A fun filled arcade simulation game which puts you in control of a range of unlockable animals and pets, on a mission to scavenge for food from Russian commuters. Surviving isn't easy when you are dodging volatile vodka, rival dogs, and the rare and dangerous Subway Bear! The developers have said this game is inspired by real life stray dogs who've learned to navigate Moscow's subway system but with their own unique twist of crazy entertainment. The game features a campaign mode with dozens of levels and over 100 unique challenges from your boss kitty: The proletaricat, a highly replayable Endless Mode with online leaderboards and a score-driven difficulty algorithm that keeps each round fresh, detailed pixel art of Moscow's world famous subway stations, fire and ice to toxic abilities, and much much to make this game worthy of picking up!